The final draw in this year's Hurler's Co-Op Draw took place in Piltown on Tuesday evening. Click on Read More below for full list of winners. Kilkenny GAA would like to thank all those who sold and purchased tickets and anyone who helkped in any way to make the draw such a success. THANK YOU! Draw No 4 in this year's Hurling Co-Op Draw was held in Piltown this week. For full list of winners click on Read More below. 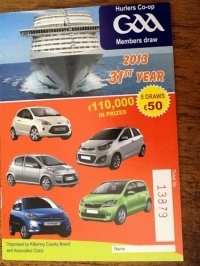 The second Hurlers Co-Op Draw was held earlier this week with the first prize of a car winging its way to Agnes Clery c/o John O Shea in Piltown. Over half of the clubs in the county had winners this time around. The next draw takes place on Tuesday 16th July. The first Hurlers Co-Op Draw of 2013 took place in Piltown this evening and the first prize of a car valued €12000 or cash prize €10,500 went to Joe Wall of Lower Corluddy, Mooncoin. Second prize of a Holiday €2500 or cash €2000 went to Callan Chairman John Walker and his wife Eileen. Third prize of €700 also went to Mooncoin in the person of Jamie Dunphy of Tubrid. Kilkenny GAA would like to thank all the clubs, promoters and supporters who continue to make the Hurlers Co-Op Draw an invaluable source of revenue for both club and county.